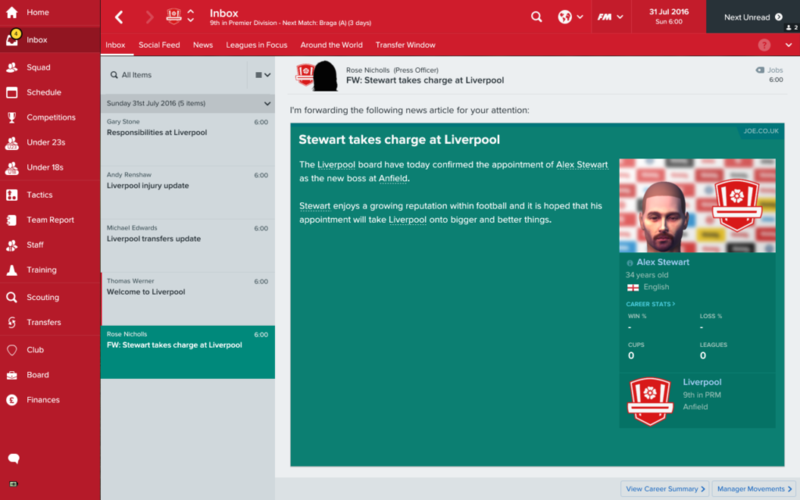 THE MISSION: Enter the world of Football Manager 2017 and beat your bitter rival to establish Arsenal or Liverpool as the dominant force in English football once more. THE CATCH: The Celtic v Rangers challenge did not go well for new Dumbarton manager Alex Stewart, while Iain Macintosh is going to find it a lot tougher than his breezy spell at Celtic. 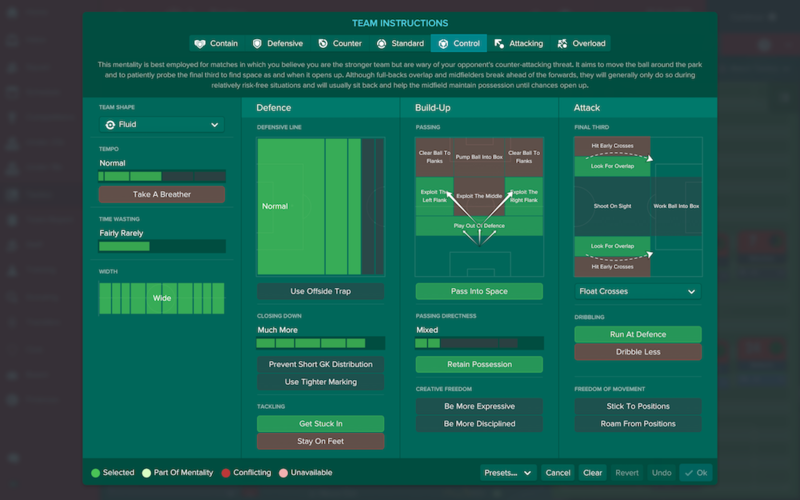 Catch up on previous projects here: Everton; Celtic v Rangers; (Revisited); The Pentagon Challenge; Alex Stewart’s FM17 Tactics Guides: Catenaccio; Atletico Madrid; Chelsea 04/05; Brazil; Roma 00/01; Hoffenheim; How To Get Better At FM17; Back To School In FM17. IAIN: I know what you’re thinking. 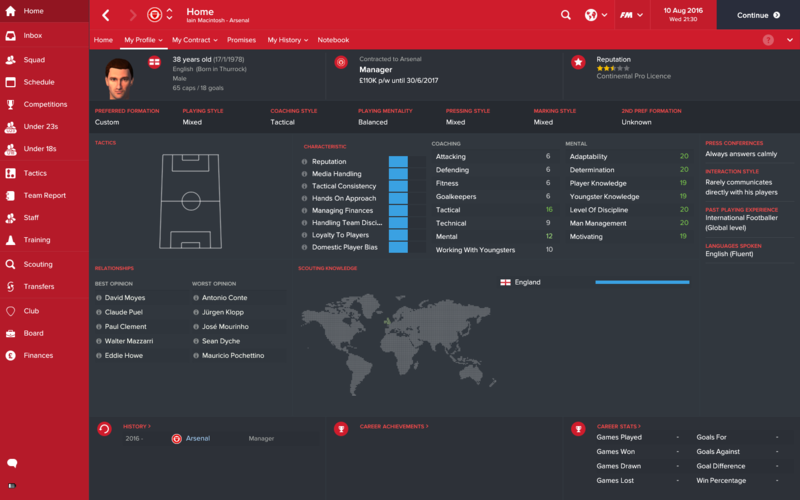 You’re thinking that the Arsenal job is too big for me. You’re thinking that, swollen with pride at my dominance of the one-horse race that is Scottish football, I’ve over-reached. And I don’t blame you. But Arsenal and I…I think perhaps that we’re kindred spirits. We both have proud histories that stretch back into the mists of time. The Gunners, under Herbert Chapman, revolutionised football between the wars and won three titles on the spin. Well, my Brett Angell-led, long-ball stylings brought similar success to Southend on CM93/94. Humble physio-turned-manager Bertie Mee won the double with Arsenal in 1971. I myself, a humble binbag-salesman-turned-manager at the time, once won the title with Newcastle United in my first season on CM01/02. 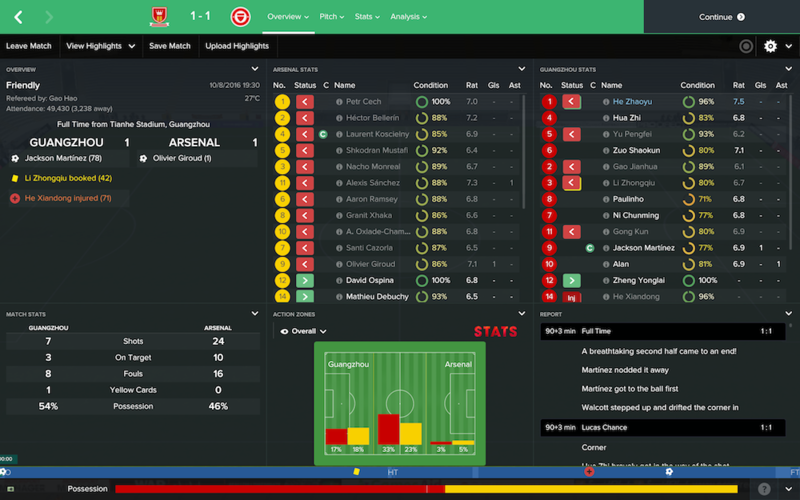 And, when you think about it, Arsene Wenger’s immediate success at Arsenal in the late 90s is almost an exact mirror for my immediate success with Norwich on FM07. And yet both Arsene and I have done little more than cling on in recent years as the modern game has overtaken us. Dear old Arsene is now the target of cruel airborne protests and I received some pretty personal tweets when I fell short at Everton. Peas. In. A. Pod. Naturally, I am keen to ensure that Arsene sticks around. I pay tribute to him in press conferences and insist that the board retain him as a director of football. I think he’ll be happier now, without the day-to-day pressure, but with a wide remit to wander around alerting me to talented youngsters in every corner of the globe. But this is a strange set-up that he’s left me. The squad isn’t bad, but it’s not great either. It’s not bad enough for widespread sackings, but it’s good enough that only really serious money will bring significant improvement. There are few here that you would consider to be genuinely world class or top drawer or top, top players. Petr Cech is still one of the finest goalkeepers in the league, Mesut Ozil is mercurial but brilliant, and Alexis Sanchez is tenacious and wonderful, but the rest of them are very firmly in the three or four star category. And while £40m is a lot of spending money compared to what I’m used to, it’s not enough to buy many five star, ready made, fresh from the oven superstars. Ross Barkley can be acquired for £35m and I have no doubt that he’d be an upgrade on Aaron Ramsey, but is midfield really the priority? Ideally, I’d like a striker, but Romelu Lukaku is £60m+, so he’s out of the question. I’m also informed that I have a ‘leadership void’ in the squad, which has to go down as the most superfluous briefing in recent history, but remains a problem nonetheless. 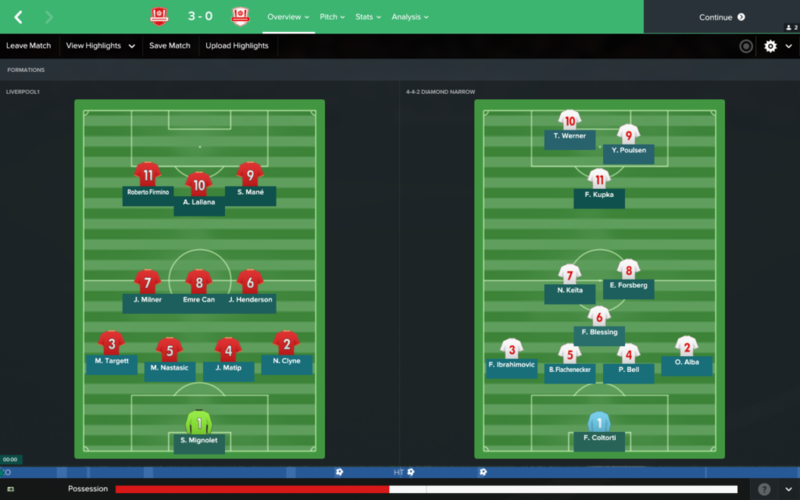 With Per Mertesacker and Gabriel injured for some time and with Rob Holding my only back-up in the centre of defence, I elect to work on that department first. And there’s only man for me. Okay, stop shouting. Please, stop shouting. Let me explain. Look at his determination. Look at his leadership. Look at his jumping. Look at yourselves. I’m not saying that Jonas is going to be the foundation stone of my rearguard, but at least the man can deal with a set-piece. At least he’ll stand in front of me and take the force of the blast. Protection. With a pace of ‘6’, we’ll have to make sure he leaves the dressing room ten minutes before the bell goes just to ensure that he’s there for kick-off, but that’s okay. We can work with that. He’ll be good for us. He’s a presence. ALEX: Take a club that’s fallen on hard times and restore it to glory? Do it head to head with Iain, who’s trying to do the same thing (but with a club that has, at least, tasted success more recently)? 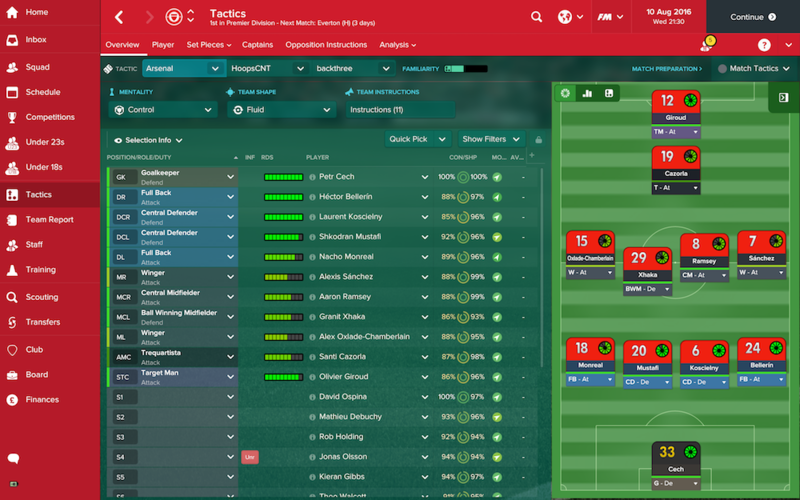 There’s no challenge more fun in FM than rebuilding a club and raising it to previous heights, particularly when doing so matches my own philosophies of scouting, youth development, and financial parsimony. But which club will it be? Who needs my dubious ability to help most? Liverpool. Lucky, lucky Liverpool. 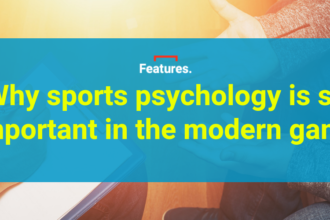 It’s the perfect club for me, really: a tradition of extraordinary success, but a recent history of failure and resentment that positively seethes with animosity towards the rest of the big boys in the league, a tradition of developing local players into club heroes, and a penchant within the scouting team for air-conditioned rooms and laptops. It’s also nice, as a Southampton fan, to be managing at least four of our former players – it’s like a school reunion but everyone else is now richer and better looking than me. Iain, applying the marginal gains philosophy that served British cycling so well, decides that we can be Continental Pro level managers with maximum footballing experience. 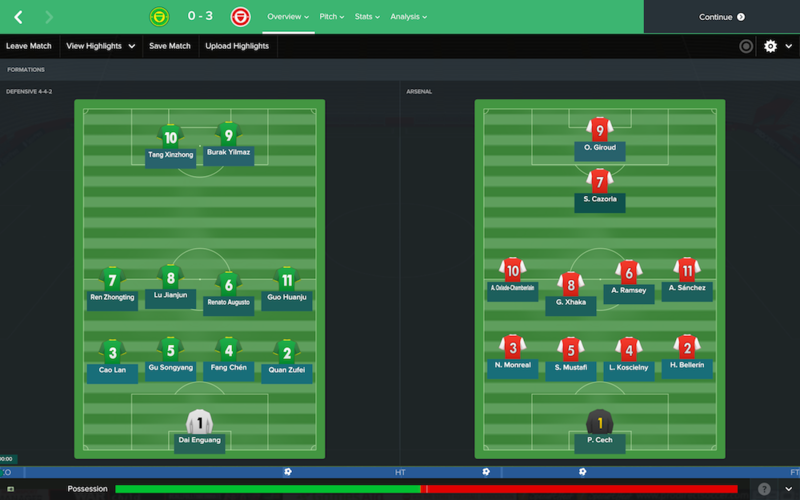 I tweak my levels so I have 20 for tactics and working with youngsters, both of which seem appropriate to my philosophy and my love of reading obscure blogs about space-orientated zonal marking. But how to manage the club that gave us the Boot Room, the most European success of any English side, and pundits of Michael Owen’s quality? 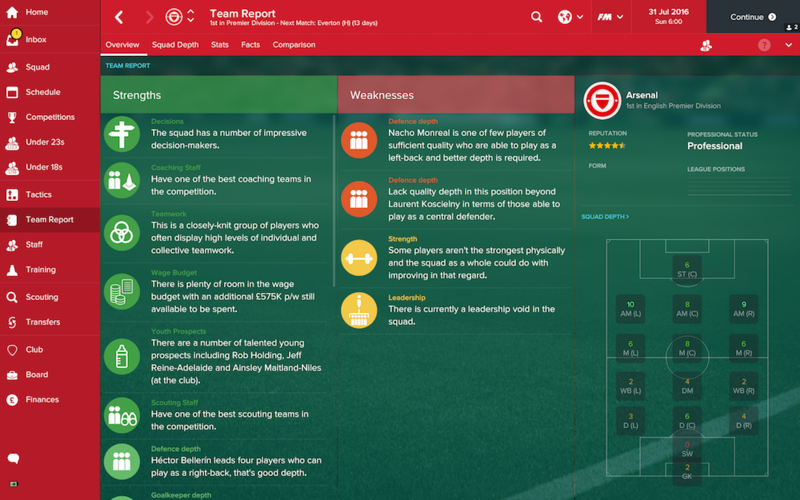 The Board have some philosophies they’d like me to adhere to: playing possession football and attacking football, signing young players for the first team, and developing players using the youth system. As two of these (the latter two) are ones that I almost always ask for anyway, I accept obligingly. The Board’s expectations are unusually reasonable: qualify for the Europa League (my preference anyway, because of the hipster-quotient of the opposition) and reach the final of the FA Cup. The League Cup is deemed ‘not important’ – fair. The bookies give us a 7-2 chance of winning the title, behind City, United, Chelsea, and Arsenal. Shortly after the odds are released, I get a solicitous phone call from Joey Barton, who’s very sorry about everything that happened at Ibrox, and wants to know exactly how good the squad is, who I’m planning to buy, and whether we’re value, whatever that means. The squad report suggests we have some issues: physical strength, teamwork, leadership, working hard, and jumping. The first four are obviously a worry, but I’ve also learned the hard way (at Rangers) that one mocks a lack of jumping ability at one’s peril. We will need to strengthen and, fortunately, Iain has decided that this time we will be able to buy players. 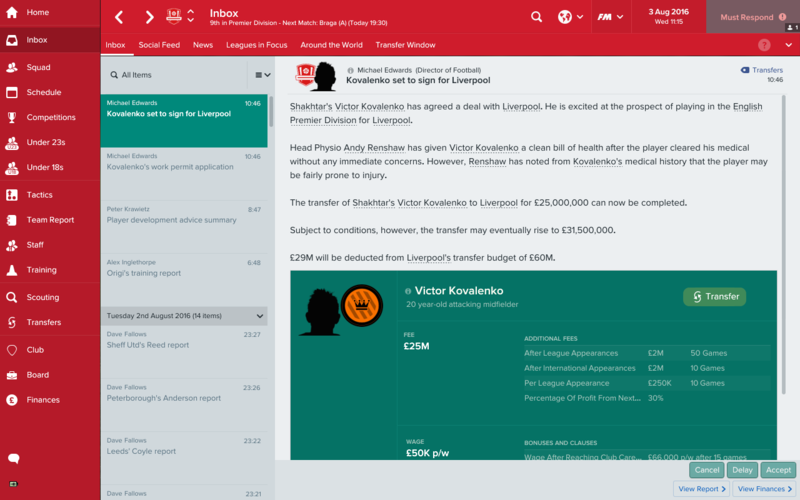 Now, while Liverpool is obviously a club with a sabermetrics-orientated transfer committee, (which is right up my Straße), and this would suggest a Moneyball-style transfer policy, which in turn means don’t buy anyone in the first window, I’m damned if I’m going to pass up the chance to recruit some good players for once. Indeed, my ‘war chest’ is £60m, with a further £467k per week available in wages, which translates to another £22m in disposable income if I adjust budgets. I almost shiver with the excitement. Like someone who’s finally debt-free after years of whittling down the financial hangover of student excesses, I go straight to shop and buy myself the most expensive pair of trainers I can find. 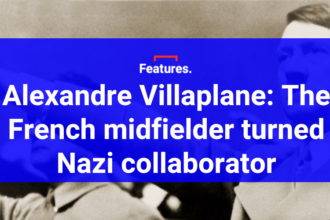 Or in this case, Victor Kovalenko, the Ukrainian attacking midfielder. There are several reasons for this £25m outlay. Firstly, he fits our tactical set-up perfectly. Secondly, he’s on City’s radar, so I want to gazump them. And lastly, at 20 years old and with five star potential, he fits our transfer philosophies perfectly. 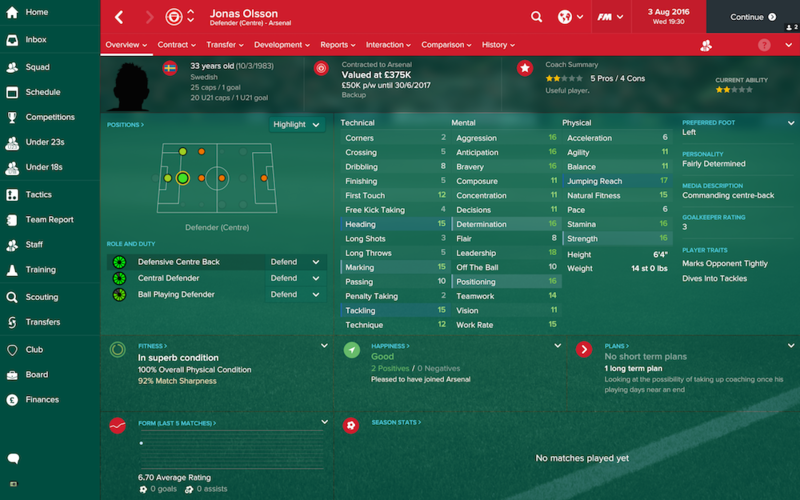 In furtherance to this business, and with an eye on squad weaknesses, I try to buy Jorge Mere, the dynamic young centre-back at Sporting Gijon, but he rejects me before I can even offer a contract. Undeterred, I turn my attentions to dynamic young centre-back Matija Nastasic, once of Manchester City. I sign him for £25m and £75k per week in wages. He’s quick, with promising levels for anticipation, concentration, and all the technical skills needed to be a strong-centre back. He’s also left footed and will compliment Joel Matip perfectly, with Klavan and Lovren able(ish) back-ups. 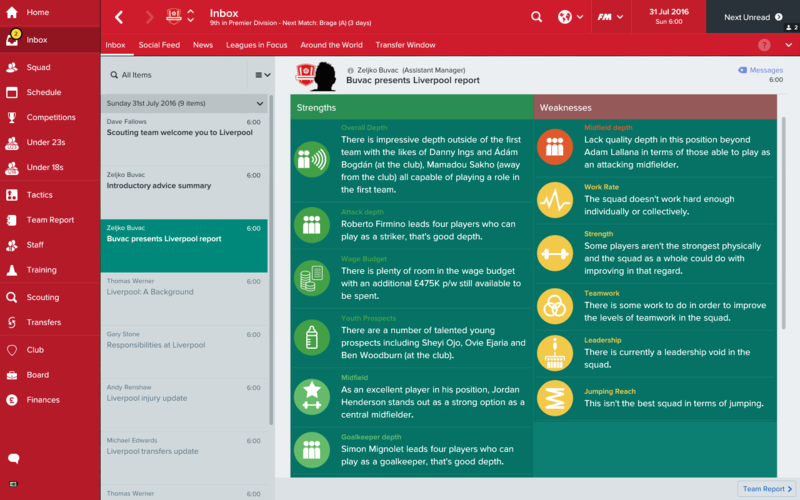 I’m also unhappy with Alberto Moreno as a first choice left-back and so I do what any good Liverpool manager does, and rely on Southampton’s youth development and scouting set-up to find me a good player. That player is Matthew Targett, a naturally attacking full-back and four star prospect, who is ready for occasional first team duty as well. In fact, given my predilection for playing youngsters, he’ll probably start the season as first choice to enhance his development. He costs £10.5m and £26k per week in wages and fits with my unspoken transfer strategy of buying as many Southampton players as I can. Antti Niemi and Phil Cannon join the back-room staff, as does Paul Hardyman. Niemi is especially pleasing for me as a Saints fan who watched him keeping goal for us in the flesh for several years. There are now at least six ex-Saints players or staff – it’s like I’m trolling my summer self, for some reason. As I did at Celtic, I’m looking to make full use of my pace on the flanks. The full-backs are quick and they can work with the wingers and overlap. Unlike Celtic, we’ll toss crosses in at altitude to make full use of target man Olivier Giroud. It may transpire that Giroud is found wanting, in which case I’ll use Alexis Sanchez as a deep-lying striker and put in low crosses, but let’s try this first and see how it goes. There will be no out-and-out DMC, unless the situation demands it, but we’ll use Granit Xhaka carefully as a defensive, ball-winning midfielder and hope that he’ll help out the centre-backs and refrain from kicking lumps out of people. We’re going to press the fudge out of everyone, get stuck in where we can and then switch from control to counter according to the state of play in the game. I want a multi-purpose Arsenal, and that means that I’ve even worked on an emergency back three as well. And that went pretty well. Lots of chances, three good goals and a nice boost to confidence. It’s meaningless, of course, in the great scheme of things, but I’d rather tonk this lot than lose to them, that’s for sure. ALEX: We have two pre-season friendlies scheduled, which is a relief after learning from the Old Firm fiasco that venturing straight into the season proper with zero match fitness and no understanding of tactics is counterproductive to say the least. 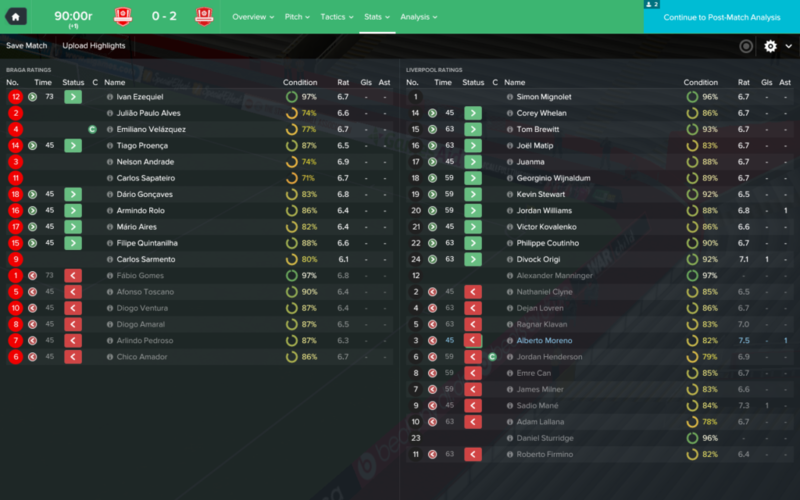 The first game is away at Braga. 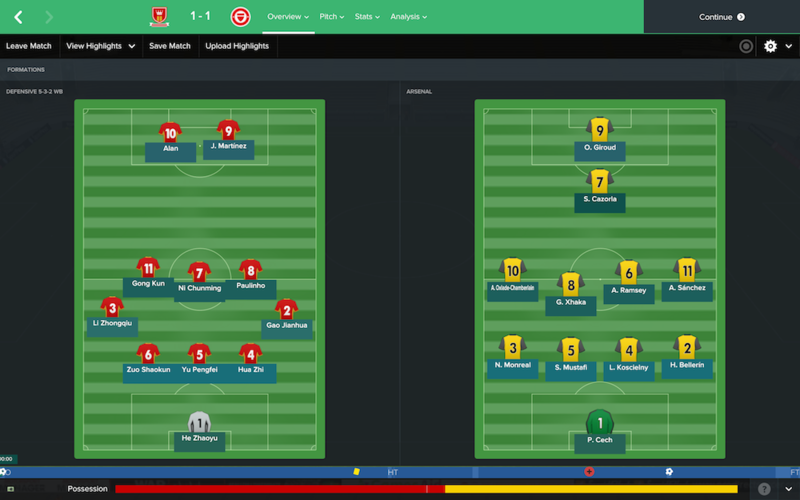 My first choice tactics are a strikerless 4-3-3, which is the same formation I’m using with Dumbarton. 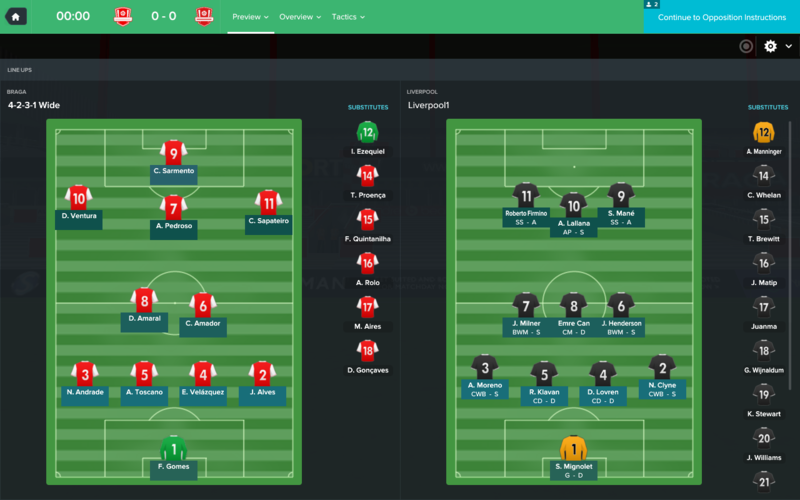 The tactic was actually developed to try to mimic Klopp’s style and it works pretty well with the players I have available, especially given that Mane and Origi are both now being retrained as shadow strikers. I have a variant as well, for teams that sit deep, so Sturridge will be able to get some game time, but for the Braga match, I use the first choice set-up. That was comfortable enough, and the chaps seem to take to quite a complex system with a minimum of fuss. Moreno is actually our stand-out player, which given that I’ve recruited competition for him might pose a conundrum further down the line; Origi also scores from the attacking midfield position, which is very encouraging. We look pretty tight at the back and fluid enough going forwards. One swallow does not a summer make, but it’s encouraging. IAIN: With the start of the season just three days away, I’m only going to use my first XI for little over half the game and then make complete changes. I don’t need any new injuries. 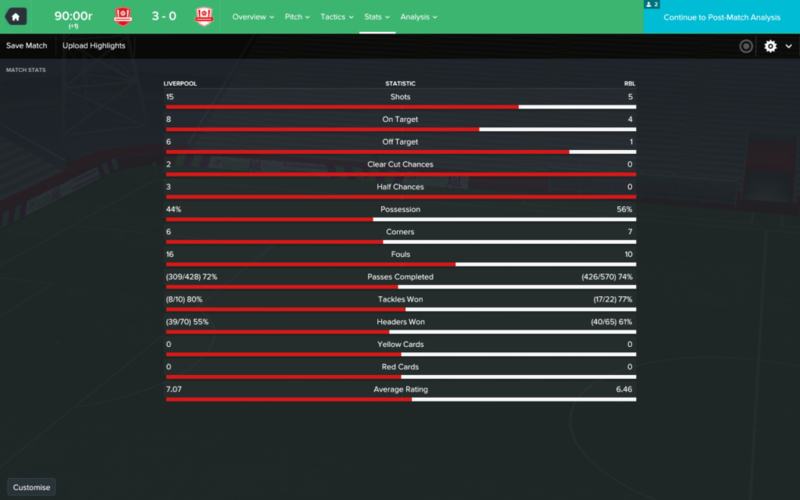 I’m not remotely concerned about the result, this is just a chance for more practice with our primary tactic. Okay, I’m a little concerned at the result. With 24 chances, I’d expect to score more than one quick goal and then fail to add any more, but at least we’re creating opportunities. We completed 11 crosses as well, a respectable 14%, so there’s a lot to be said for this, ‘whip it into the big lad in the glittery pants’ tactic. At least in a friendly. We won’t know for sure until we play a Premier League game. And who have we got first? 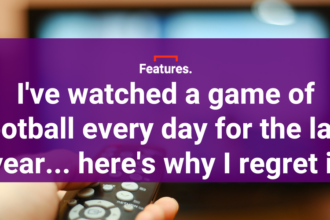 Oh, of course. It’s Everton. ALEX: I schedule a friendly against the much-maligned RB Leipzig at home, largely so I can have a look at Naby Keita and Timo Werner as possible signings. New signings Nastasic and Targett come into the squad, and Matip is fit enough to start in a very promising looking, half ex-Saints back four. Emre Can anchors a tough looking midfield, with Lallana, Firmino, and Mane completing the almost-forward line. Lovely stuff! Clyne, Nastasic and Targett are all excellent, and Mane scores twice and Lallana once, as we brush Leipzig aside with ease. Even Mignolet plays well enough to rate a 7.00, although I will probably look to bring in Karius once he’s fit. But five goals scored and none conceded with a tactic that is both new and somewhat strange is a pretty healthy start to my tenure. 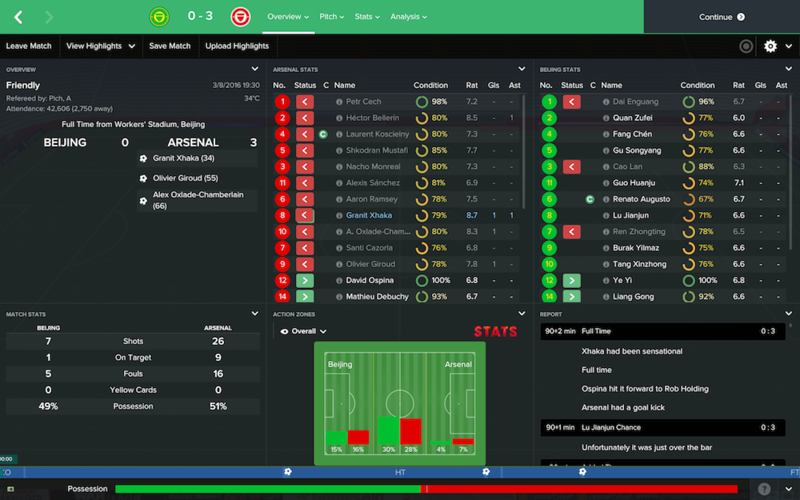 I’ve spent some money, brought in some players and bulked out my coaching staff, and won my pre-season games convincingly. Iain – well, I’m not entirely sure what Iain has been up to, asides from several scouting trips to the West Midlands. He’s an odd one. But I’ve learned not to get complacent, just because I’m up against him. It’ll be a tough ask to restore glory to this once great team, but I feel I’ve started to assemble the players and instruct them in a style that will work. Think you can do better? 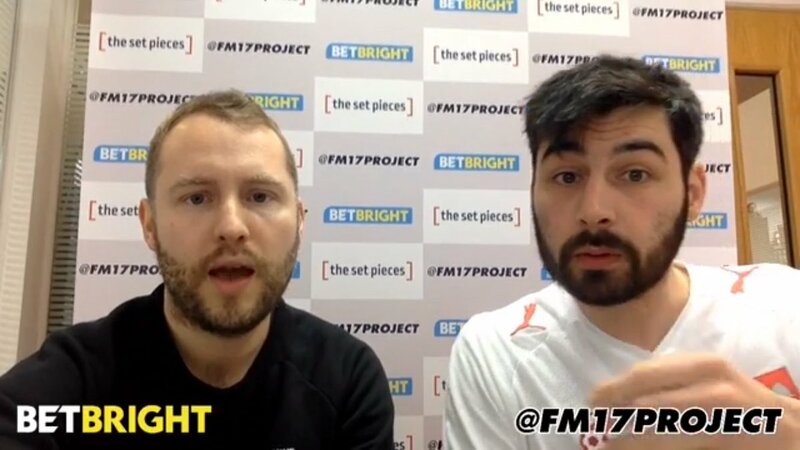 Look out for the final preliminary challenge later this week to take part in the BetBright FM17 Cup.